Festival Kebudayaan Hyo Seok di PyeongChang. Tapi sebelum nak menyampai ke tahun 2018, sebenarnya ada pelbagai aktiviti kebudayaan yang akan berlangsung sekitar Gangwon-do...contohnya macam yang Sally nak cerita ni...Hyo Seok Cultural Festival ataupun Festival Kebudayaan Hyo Seok di PyeongChang. Festival Kebudayaan Hyo Seok merupakan sebuah festival yang diadakan sebagai memperingati penulis buku Lee Hyo Seok dan novelnya yang terkenal, "When Buckwheat Flowers Bloom" yang menceritakan tentang kecantikkan Bongpyeong dan kaitannya dengan kehidupan manusia. 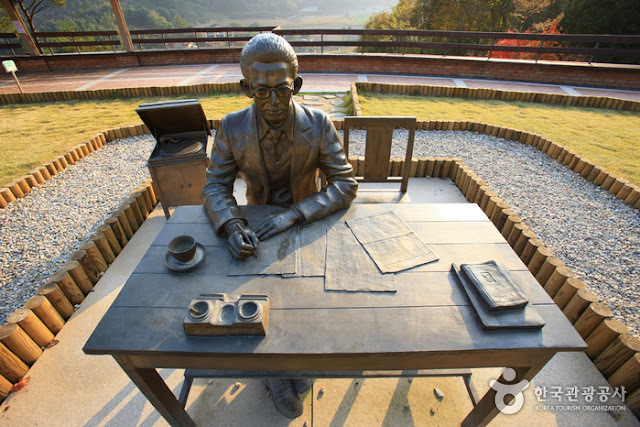 Lee Hyo Seok 李孝石 (1907-1942), who wrote under the pen-name 'Gasan' was born February 23, 1907 in Pyeongchang, Gangwon- do. Lee wrote more than 70 pieces of fiction and first attracted attention of the literary world in 1928 when his story ˹City and Ghost˼ was published in 1. Lee published many other works including ˹Unanticipated Meeting˼, ˹Shattered Red Lantern˼ and ˹At Sea Near Russia˼, all of which reflected his socialist sympathies. ˹When Buckwheat Flowers Bloom˼ is set in Lee's hometown Bongpyeong-myeon, Pyeongchang-gun and the area is still famous for its buckwheat production. 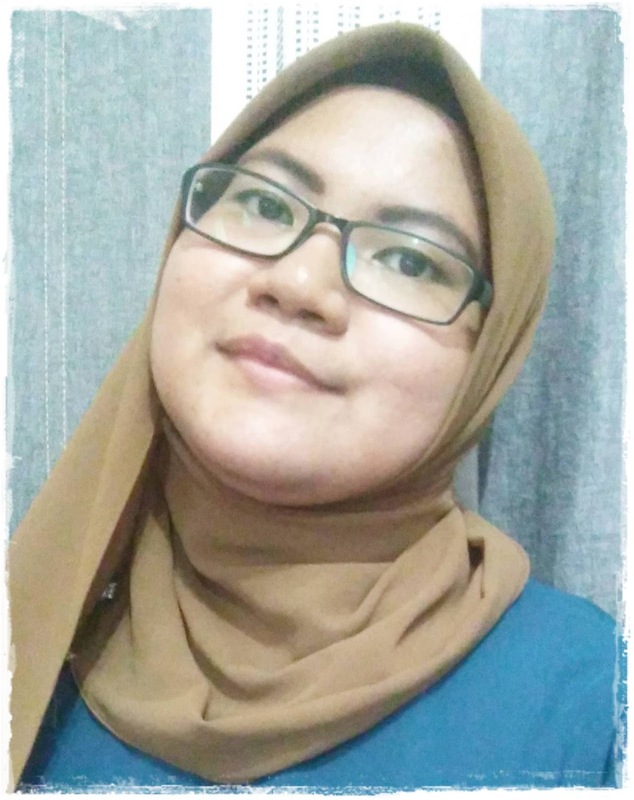 Secara amnya, festival ni ada menganjurkan beberapa program termasuklah pameran puisi, malam kesusasteraan, pertandingan menulis esei Hyo Seok, beberapa nature experiences contohnya macam mewarnakan kuku menggunakan balsam, demonstrasi memasak mee soba (buckwheat) dan macam-macam lagi...Pengunjung pun boleh melawat tempat lahir Lee Hyo Seok dan muzium memorial beliau. Cara nak ke Festival Kebudayaan Hyo Seok di PyeongChang: Take an intercity bus to Jangpyeong Intercity Bus Terminal. From Jangpyeong Terminal, take a local bus bound for Bongpyeong or Phoenix Park shuttle bus. 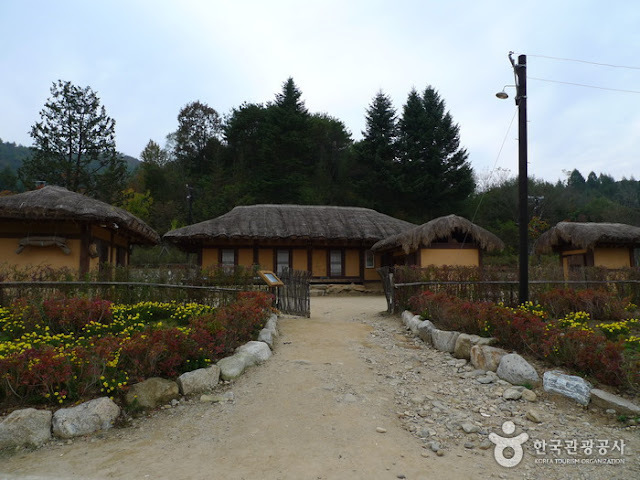 Lee Hyo Seok Culture Village is the place where the author Lee Hyo Seok was born and raised. The village is also the setting of the author’s story ˹When Buckwheat Flowers Bloom˼, one of the most celebrated Korean short stories to date. In 1990, the village place was designated ‘first national cultural village’ by the Ministry of Culture and Tourism. 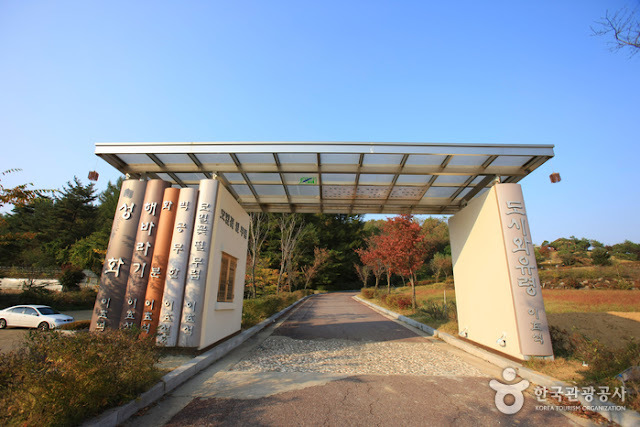 The village is comprised of the author's birth house, a water mill, Chungjujip, Gasan Park, Lee Hyo Seok Memorial Hall, and a buckwheat museum. 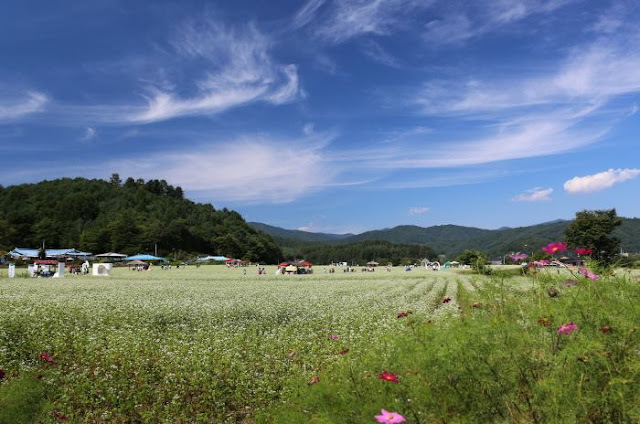 At the height of the blossoming season, you can enjoy the beautiful scenery of snow-white fields of buckwheat flowers and from late August to early September, the annual Lee Hyo Seok Cultural Festival takes place. The literary house consists of the Literature Exhibition (chronology of Lee Hyo Seok’s works), Literary Class, Art Research, Creative Idea Room, and a Theater for literary plays. There is also a mock-up of the old Bongpyeong Marketplace and videos for children, as well as a number of different activities. The facility houses valuable documents such as the author’s first printed newspaper, magazine, and book publications. In addition to its deep literary significance, the house is known for its exquisite exterior, Literary Garden, and buckwheat flower trail. tak pernah lagi merasa join festival2 kecuali yang tangkap ikan trout je.. hehe..